Lon Seidman, chairman of the Essex Board of Education, makes the case for a proposal that would ease cooperation across districts. From left are Sen. Norm Needleman, Deep River First Selectman Angus McDonald, and Region 4 Superintendent Ruth Levy. Sen. Norm Needleman, D-Essex, has an alternative to the hotly contested school regionalization bills that he says would help small towns voluntarily share more services and save money. It’s a proposal that would allow a consortium of towns to act as “a local education agency” as a way of maximizing cooperative agreements and efficiencies without establishing a regional school district. “We are steeped in a DNA that wants home rule. We can’t help that,” Needleman said Tuesday, but he believes his proposal would allow towns to maintain local control while choosing when it makes sense to collaborate and save money. Needleman’s original proposed bill, Senate Bill 572, has been replaced with language in Senate Bill 1069 that calls for a study of the idea, as well as some language that would allow such collaboration for special education purposes. Patrice McCarthy, deputy director and general counsel for the Connecticut Association of Boards of Education, endorsed Needleman’s approach. Gov. Ned Lamont said his regionalization bill uses “carrots” to encourage towns to regionalize, but others see it as punitive because it says that small districts — defined as districts with fewer than 10,000 residents, fewer than 2,000 students or with only one or two schools — would be required to share a superintendent with another district or name a chief executive officer to oversee the schools. If such a district chooses instead to maintain their own superintendent without sharing, Lamont’s proposal says, the commissioner of education may withhold funding in an amount equal to the superintendent’s salary. A bill proposed by Sen. President Pro Tem Martin Looney, D-New Haven, would make the state’s already existing probate districts the “default position” if his proposed commission charged with developing a plan to implement regional school districts for towns with fewer than 40,000 residents fails to get a plan signed into law by July 1, 2020. A third bill, proposed by Sen. Majority Leader Bob Duff D-Norwalk and Sen. Cathy Osten D-Sprague would require any school district with a student population of fewer than 2,000 students to join a new or existing regional district so that the total student population of the expanded district is more than 2,000. If a district is not joining a regional district, the bill says, it must inform the state Department of Education in writing about its reasons. 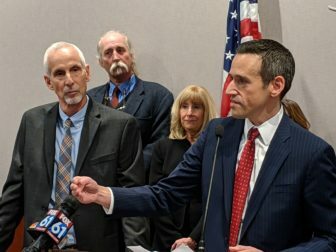 Because the bills proposed by Looney and Duff were not drafted by March 15 both bills are now dead, but lawmakers say the idea of regionalization is still alive and likely to emerge as part of other bills or the state budget as the session proceeds. Needleman, who is also first selectman in Essex, explained that his town shares a regional middle school and high school with Chester and Deep River, but each district retains its own board of education. The result is there are four boards of education, including one for each town and a fourth for the regional district, as well one additional board of education, a fifth, called a “supervision district” for shared services. Under the supervised district, the towns do share some services, but as Needleman described it there are many services they would like to share but cannot because they are not considered a local education agency. For instance, Ruth Levy, who is superintendent for Region 4, covering the three towns, said she is able to regionalize pre-kindergarten programs but once a child reaches the age of 5, she can no longer regionalize that program under state regulations. She’d also like to conduct staffing matters and payroll for the regional district as a whole. In addition, sharing nursing services across the towns and special education services would help greatly, Levy said. Why don’t the three towns fully regionalize? Lon Seidman, who is the chairman of the Essex Board of Education, said that was considered but because regionalization results in averaging costs for elementary school students across the district, there was no incentive for the smallest town to participate because the town would have been hit with a half-million dollars more in expenses. Seidman said it’s not only partially regionalized districts like his own that would benefit from this arrangement, but also fully autonomous towns that could enter into an agreement and share more services.